The general perception of childbirth is that the process has gotten significantly safe over the years, thanks to medical advancements such as sophisticated pre-birth screening for issues and new and refined tools to aid in delivery. However, recent research has demonstrated that giving birth in the United States can be risky: a 2017 study published by NPR and ProPublica found that the US has the worst rate of maternal deaths in the developed world. 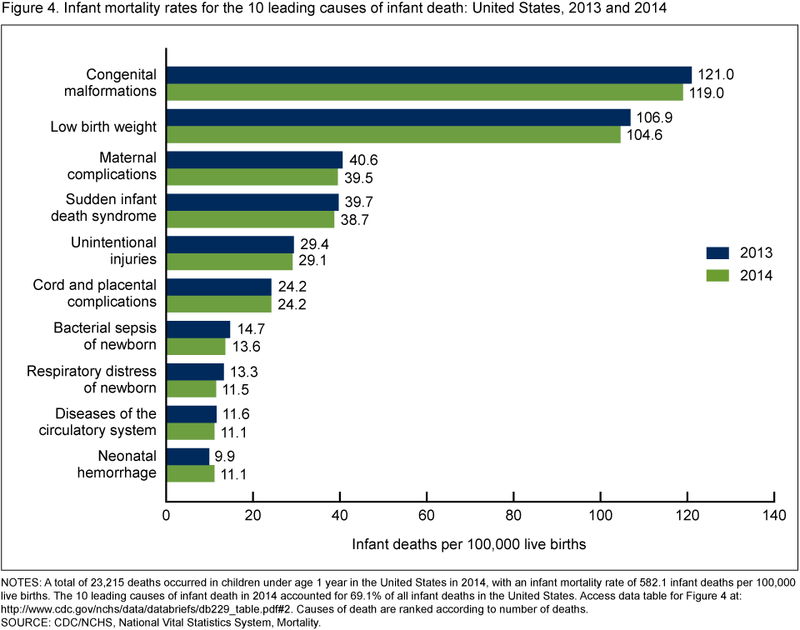 The CDC reported that of the 23,215 deaths of infants under the age of one in the year 2014, the top 10 leading causes of death included unintentional injuries, cord/placental complications, respiratory distress, and hemorrhage. Many of these occur during the birth process, meaning that there is still a risk of injury or death to both a mother and a newborn during childbirth. Cerebral Palsy is is a disorder of movement, muscle tone or posture that is caused by damage that occurs to the immature, developing brain, most often before birth. Failing to obtain relevant medical information/run certain tests and/or misinterpret the result of test can lead to cerebral palsy. Additionally, improper assistance during a difficult or prolonged labor (such as failing to provide a timely intervention) can result in cerebral palsy. Erb's Palsy is specifically when the child has an injury in the upper nerves of the arm. If this occurs, the child may be able to move his or her fingers, but not the shoulder. Other times the arm may be totally paralyzed. . During birth, this is usually caused when an infant's neck is stretched to the side during a difficult delivery. Certain medical tools such as vacuum extraction tool or forceps may be used improperly during delivery and can resulting in this type of stretch. A newborn has an extremely fragile skeletal structure. Injuries during the birthing process can result in bone fractures. Fractures of the clavicle and femoral fractures can both occur if the baby is in a breech position and a vaginal birth occurs. It is up to the medical professional overseeing the birth to ensure that a C-section is ordered if injuries to the baby might occur through vaginal delivery. In addition, the misuse of forceps or vacuum-extraction tools an result in a bone fracture at birth. An injury to the spinal cord can be incredibly dangerous, resulting in varying degrees of paralysis. If too much pressure is exerted on the infant through the use of forceps or a vacuum-extraction tool in an attempt to remove the child from the birth canal, a spinal cord injury may result. Additionally, if the child's spine becomes twisted or over-extended during birth, it may be injured. When the spinal cord is injured, the severity of the injury depends on where on the spine the injury is located. Generally, the higher up on the spine that the injury occurs, the more significant the resulting damage. A Cephalohematoma is a hemorrhage of blood between the skull and the periosteum (a dense fibrous membrane covering the surfaces of the skull.) Cephalohematomas typically occur over the occipital bone. An infant with this condition will typically have a bump on his or her head where the hematoma is located. This type of hemorrhage can be the result of trauma as a result of improper use of of delivery-assistance tools such as a forceps or a vacuum-extraction tools. Infants with cephalohematoma are at a heightened risk for developing jaundice, due to the fact that the process of the blood being broken down by the body cause the levels of bilirubin increase. Perinatal asphyxia (also called birth asphyxia) occurs when there is an inadequate intake of oxygen by the baby during the birth process –before, during or just after birth. This lack of oxygen can affect the child's organs as well as the brain. There are numerous potential causes of perinatal asphyxia, including the mother's blood pressure being too high, debris blocking the infant's airflow, anemia, umbilical cord prolapse, and more. Lack of oxygen can cause significant brain damage, damages to other organs, and even death. Therefore t is imperative that doctors and other medical professionals assisting with the birth take fast action if a baby is showing signs of distress. Failure to do so can have devastating results. An intracranial hemorrhage occurs when there is bleeding somewhere within a child's skull. There are various types of bleeds with different names, depending on where in the infant's skull they may occur. A hemorrhage can occur if a baby's head is injured during the birthing process. This type of injury can occur if a delivery assistance tool such as a forceps or vacuum extraction device is not used properly. In addition, trauma can occur if a doctor or other medical professional exerts too much force on a child's skull during the delivery process. Bleeding in the brain during the birth process can be very severe. A child can be left with permanent brain damage if bleeding is not treated properly and promptly. A subconjunctival hemorrhage is another type of bleed within the body. This type of hemorrhage is present when there is bleeding in the conjunctiva, the thin, moist, transparent membrane that covers the white part of the eye and the inside of the eyelids. It is typically caused by some form of distress occurring during birth that caused the blood vessel to burst. A subconjunctival hemorrhage on its own may not be cause for concern. However, it can be an indicator of a more serious issue, such as other presser-caused injuries discussed above. Additionally, a severe hemorrhage can result in loss of vision or other issues related to the eye. A Caput Succedaneum refers to a particular type of swelling that can occur on a newborn's head when pressure has been exerted during vaginal delivery. ​The use of a delivery assistance tool like a vacuum can cause this condition. Complications such as jaundice and alopecia can accompany a caput succedaneum. Additionally, more serious birth injuries can be misdiagnosed as the less serious caput succedaneum. If you believe that an injury your child sustained during birth was caused by medical malpractice, contact our Baltimore-based birth injury lawyers. We work with our staff physician to fully investigate the circumstances of your case, advise you of the best course of action along the way, and take the fight to the courtroom if necessary to get you the compensation you deserve.